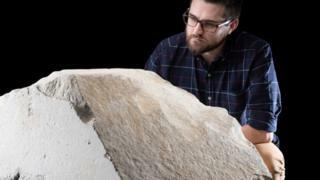 The only casing stone from the Great Pyramid of Giza to be displayed anywhere outside Egypt is to go on show in Edinburgh. The large block of fine white limestone will go on display at the National Museum of Scotland from 8 February. It will be on public view for the first time since it came to Scotland in 1872. The news comes on the bicentenary of the birth of Astronomer Royal of Scotland, Charles Piazzi Smyth, who arranged for it to come to the UK. It is one of the few surviving casing stones from the Great Pyramid and will be displayed in a new, permanent gallery at the museum called Ancient Egypt Rediscovered. It will form the centrepiece of a display about the design and construction of pyramids in ancient Egypt, the only display of its kind in the UK. It was brought to Britain for Charles Piazzi Smyth, who, alongside his geologist wife Jessie, conducted the first largely accurate survey of the Great Pyramid in 1865. The couple originally displayed the block in their Edinburgh home. Built for King Khufu and dating about 2589-2566 BC, the Great Pyramid of Giza is the oldest and largest of the three pyramids in the Giza pyramid complex. While its interior was made from local stone, it was clad in bright white, polished limestone brought from a quarry at Tura, 15km (9 miles) down the Nile. It would have gleamed in the sun and had a smooth, shining finish, unlike the rough, "stepped" surface which is more recognisable today. Dr Margaret Maitland, senior curator of ancient Mediterranean at National Museums Scotland said: "We are very excited to be able to offer our visitors the chance to see the only casing stone from the Great Pyramid on display anywhere outside of Egypt. "One of the seven wonders of the world, many people don't know that the Great Pyramid would have appeared very different when it was first constructed, thanks to a pristine cladding of polished white limestone. "This casing stone will give visitors to the National Museum a fascinating insight into how one of the most iconic buildings on the planet would have once looked." Few casing stones survive on the Great Pyramid itself. In 1303 AD, a huge earthquake loosened some of the stones, many of which were taken to use for buildings elsewhere. The block in National Museums Scotland's collection was found buried among rubble at the foot of the Great Pyramid. On display alongside it will be some of Charles Piazzi Smyth's measuring equipment and statues of Imhotep - the inventor of the pyramid who was later deified as a god of wisdom - and of King Snefru, who commissioned the first true pyramid. Ancient Egypt Rediscovered is a new, permanent gallery at the National Museum of Scotland, covering 4,000 years of history. The opening of the gallery coincides with the 200th anniversary of the first ancient Egyptian objects entering National Museums Scotland's collections. Objects on display include the only intact royal burial group outside Egypt, the only double coffin ever discovered in Egypt and a cosmetics box which is one of the finest examples of decorative woodwork to survive from ancient Egypt. The gallery will also chart the remarkable contribution made by Scots to the development of Egyptology. It is one of three new, permanent galleries to open at the National Museum of Scotland on 8 February. The others are Exploring East Asia and Art of Ceramics. The launch of these three galleries marks the end of a 15-year, £80m transformation of the National Museum of Scotland.